Chandigarh 31st May:- Health & Family Welfare Minister Punjab Brahm Mohindra here today launched a comprehensive health awareness campaign on Hypertension and flagged off van for awareness campaign that will cover the major village and towns of Punjab for 30 days to generate awareness on non communicable diseases. 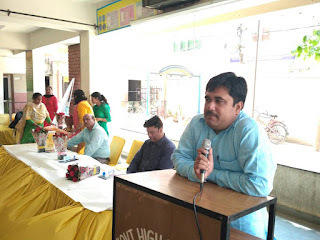 Speaking on the occasion Brahm Mohindra stated that hypertension is the commonest non-communicable disease and it usually starts in the most productive age group that is around 30-35 years of age. As per NFHS-4, mild hypertension (140-159/90-99 mm Hg) is seen among 10.5% women and 17.4% men, while 2.7% women and 4.4% men have moderate to severe hypertension in 15-49 years age group. Another non-communicable disease risk factor study conducted by PGIMER, Chandigarh estimated that 40.1% population had raised blood pressure whereas it was higher at 61% (47% men and 31.5% women) in population aged 45-69 years. Health Minister said further that Department of Health & Family Welfare has started screening of all individuals above 30 years of age under 'National Programme for Prevention and Control of Cancer', Diabetes, Cardiovascular Disease and Stroke. The screening is being done at population level through ANMs and at institution level by doctors. Till date 22, 68,537 individuals have been screened for these diseases and 5,35,620 (23.6%) persons have been found to be suffering from Hypertension. During 2016-17, on an average 1,13,160 individuals were screened every month out of which 14,250 (12.6%) were found hypertensive and put on treatment. Brahm Mohindra said that the treatment for hypertension is available free of cost for everyone at all government health institutions. Any individual who is detected to be suffering from hypertension is put on treatment by the doctor and the follow up is given at the village level by ANM. All hypertensive are given medicine for one month at a time so as to minimize their visits to the health institutions. Brahm Mohindra said that individuals suffering from Diabetes are more prone to hypertension, cardiac disease and stroke. It causes changes in the eye which may lead to blindness, affects kidneys, liver, heart as well as brain. Hypertension predisposes the individual to cardiac disease and stroke. Health Minister further said that hypertension is caused by multiple factors including poor diet- rich in saturated fat, high salt intake, stress, lack of exercise, sedentary lifestyle, smoking and use of other forms of tobacco, alcohol intake and a positive family history. Health & Family Welfare Minister said that Prevention of hypertension along with early detection and timely treatment is very important for maintaining good health of the community. 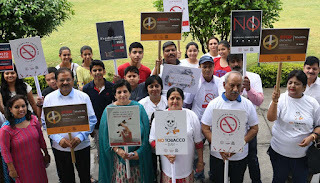 Chandigarh 31st May:- On the occasion of the World No Tobacco Day, Citizens Awareness Group in collaboration with Chandigarh Press Club took out a walk to make people aware about the ill effects of the substance use. The walkathon kick started from Press Club sector-27 crossing various main points of the city culminated at the club. 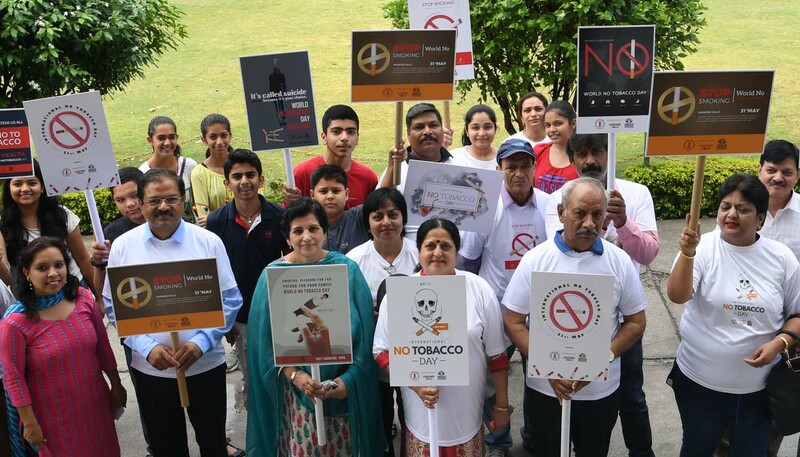 People carried placards that highlighted the bad effects of tobacco and exhorted people to build a tobacco free society. They also stopped at MRA Senior Secondary Model School and met the Principal Mrs Saroj Savant to spread the message among young students. Later in the day, an awareness programme was held where experts shared their views. As per Chairman of the Citizens awareness group Surinder Verma, that Tobacco and its ill-effects need to be highlighted in society. It is curse that the society needs to do away with. He added that if we need a healthy generation, we need to do away with this menace. We have taken pledge from people to say no to Tobacco to build healthy future. Jaswant Rana, President of Chandigarh Press Club, also spoke on the occasion. Jaswant believed that nothing harms society more than tobacco that takes youth back to dark arenas. He said that youth should know that this is a thing that will not let them be healthy in a way effect their health and their family life in the long run. While sharing his views, Ashim Sanyal, COO, Voluntary Organization in Interest of Consumer Education (VOICE) said that World No Tobacco Day is being observed from last 23 years and it has brought lot of changes in the mindsets. Our organization has been holding various awareness programmes in school and colleges so that youngsters don't develop this habit at the young age. Senior Congress leader and former union minister for Railways, Pawan Kumar Bansal said that tobacco consumption is roadblock to economic growth. Governor of Haryana, Prof Kaptan Singh Singh Solanki was the chief guest at the event. While speaking on this significant day, Prof Kaptan Singh Solanki said that we have to No to Tobacco completely to fulfill the dream of a healthy society. I feel that the problem will not be curbed by laying only stringent laws but a widespread public opinion should be created. It can help strengthening will power which can go a long way to stop the menace. Chandigarh 31st May:- The Producer and Dj-Duo Twin Sync is a team of Dj Rdg and Sahil Saxena. They are Djs/producers from city beautiful Chandigarh who recently released their debut Endeavour EP worldwide on all major music platforms like, beatport, spotify and apple music. Dj Rdg said that the concept behind EP Endeavour is to make people dance. Endeavour EP contains two tracks1. Endeavour, 2. Hypnotize. Endeavour is full of spark and exuberance track with heavy bass line which will give you rocking dance experience on the contrary Hypnotize is a melodic track with nice progression. He further said we are working on vocal version of these tracks and going to release in next month. 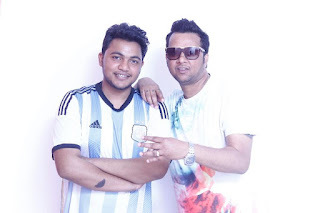 Dj Rdg stated that what made a huge difference in our career was the decision to start producing music together with Sahil Saxena. Before being a DJ was just a hobby. He had no plans to go big, but when we started producing music together under the name of Twin Sync, people began liking our music and then we decided to make some original tracks & that's how we make Endeavor EP. Shine OM Music record label gave us chance to release these tracks through their record label as Shine om music always encourage the upcoming Djs and artists to show their real talent worldwide. Chandigarh 31st May:- The District Legal Services Authority S.A.S Nagar has today on 31.05.2017 organized a Seminar on the occasion of "World No Tobacco Day". 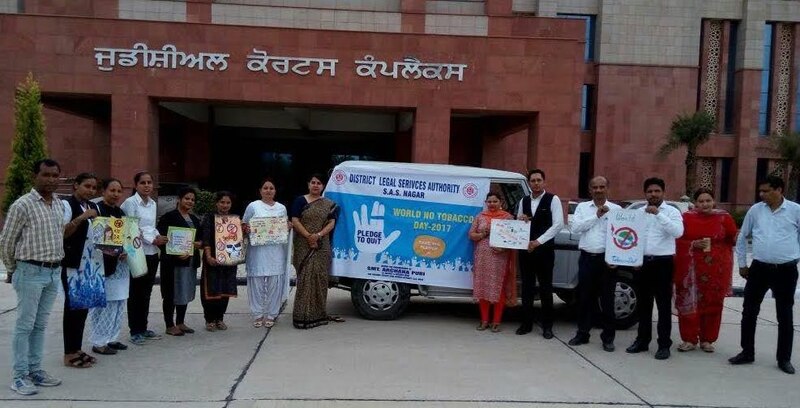 A drive against Tobacco carried out by the team of Panel Lawyers and PLVs, who were sent to various slum areas, in order to sensitize the residents about ill effects and convince them to leave the use of drugs. Mrs Monika Lamba, CJM-Secretary DLSA Mohali, flagged off the team of Panel Lawyers to the slum area near Industrial Area, S.A.S. Nagar, Mohali. Today a team of Panel Lawyers and Para Legal Volunteers reached out to poor and extremely downtrodden segment of the society in the slum areas and sensitized the residents about the importance of the day. Further, the team explained to them to get rid of this bad habit. At the same time, the Panel Lawyers and Para Legal Volunteers also went to different downtrodden areas spreading message about today's importance and about the facilities which are available in the Office of District Legal Services Authority, for weaker, poor and down trodden section of the society. On the occasion of "World No Tobacco Day" Drawing Competition were also held in all government schools of District S.A.S. Nagar on the said topic, in which best two drawings of the students were selected and certificates of participation were also distributed to the children. Chandigarh 31st May:- The Department of Anatomy, PGI, Chandigarh received the body of 77 years old Dharam Vati Maini R/o #702, Sector 11, Chandigarh, as a donation today, who expired on 31.05.2017. The department is grateful to the family and admires them for this noble gesture. Chandigarh 31st May:- An award function was held at CTP, Sector 23, Chandigarh to recognize the good work done by Civilians and police officials. 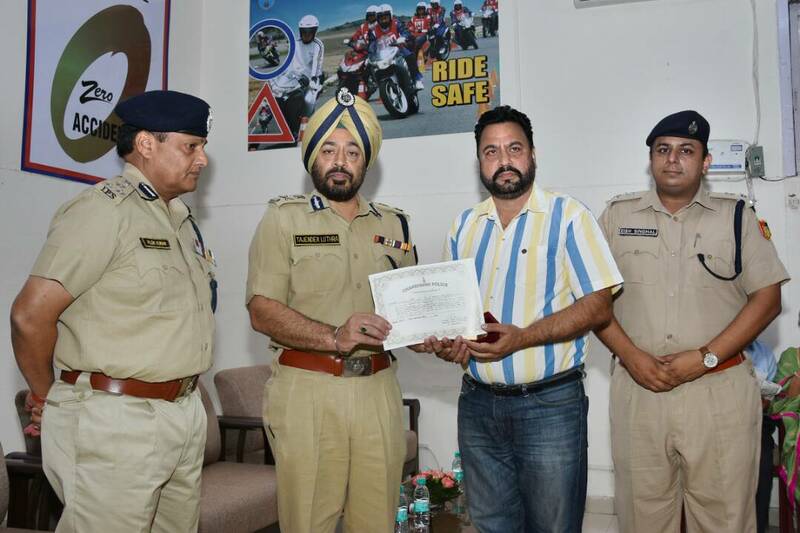 On this occasion, police personnel who retired from police services after attaining the age of superannuation were also honored by Tajender Singh Luthra, DGP/UT. Alok Kumar, DIG/UT, Eish Singhal, Senior Superintendent of Police, UT, Chandigarh along with DSPs and Inspectors and other police officers were also present at the Function. The seven police officers who retired after attaining the age of superannuation are (1) Inspector (ORP) Om Parkash, (2) Inspector (ORP) Dharam Pal, (3) Insp (ORP) Devinder Pal Singh, (4) Insp. (ORP) Amrao Singh, (5) Sub Inspector (ORP) Ashok Kumar, (6) ASI (ORP) Satwant Singh and (7) Ram Dass, Water Carrier. All retirees were honored by the W/DGP/UT with momentums and certificates. The families of retired police officers were also invited on this occasion as a guest of honor. The following police personnel have been rewarded with cash reward Rs. 5,000/- and commendation certificate class-1 for their good work and best performances in performing their assigned duties with utmost devotion and keen interest. Swaran Chaudhry, Principal/Captain (Retd. ): - He is providing valuable services to Chandigarh Police by conducting many training classes for RTC recruits and refreshers regarding personality development, education and general behavior with public. He is providing volunteer services as Traffic Marshal on daily basis. He has been rewarded with cash Rs. 5,000/- and Commendation Certificate-1. Sunil Sharma # 3745, Sector-22-D, Chandigarh: - He is very helpful in conducting various traffic awareness programme. He has donated blood 57 times to save the precious lives in danger. He is co-operative in conducting various traffic awareness camps and drives. He is contributing his valuable time with traffic police in interest of general public. He has been rewarded with cash Rs. 5,000/- and Commendation Certificate-1. Khushi Ram # 3036, Sector-45-D, Chandigarh:- He helped Chandigarh Police to caught the snatchers on the spot near Mandi Ground, Sector 45, Chandigarh on 21/22.05.2017. The Complainant Khushi Ram done a appreciable job. He has been rewarded with cash Rs. 5,000/- and Commendation Certificate-1. The workers and officials of Police Hospital, Sector 26, Chandigarh who were found to perform their duties with great interest dedication and utmost devotion were also rewarded i.e. Yashoda Dobhal, Pharmacist, Vidhya Devi, Ward Servant, Smt. Sheela, Sweeper. They have been rewarded with cash Rs. 5,000/- and Commendation Certificate-1. Dev Raj (Auto Driver): - During the investigation of case FIR No. 109 dated 22.05.2017 U/S 454, 380 IPC, PS-Ind. Area, Chandigarh, Dev Raj (Auto Driver) helped Chandigarh Police to arrest the accused in above said case. He has been rewarded with cash Rs. 5,000/- and Commendation Certificate-1. A team consisting following Police Officials, Insp. Davinder Singh, SI Krishan Kumar, ASI Parvinder, HC Joginder Singh, HC Jaimal Singh, HC Narinder Singh, C Sandeep Kumar, C Karambir Singh, C Sunil Kumar, C Inderjit, C Inder Pal, C Parveen Kumar, Vol. Parveen Kumar were also rewarded with suitable cash reward and Commendation Certificate Class-1. They took prompt action and was able to work out the case case FIR No. 109 dated 22.05.2017 U/S 454, 380 IPC, PS-Ind. Area, Chandigarh by arresting the accused persons with sincere efforts and also recovered all stolen articles gold, silver & artificial jewelry worth Rs. 7-8 lacs and mobile phone and Xcent car from their possession. Chandigarh 30th May:- After a hectic week at work, Sundays then make it a perfect day to slip into your pajamas and watch your favorite romantic movie. To add to your Sunday splendour, &pictures, Naye India Ka Blockbuster Movie Channel, brings romantic-drama Sanam Teri Kasam on Sunday, 4th June at 3 PM. Starring the handsome Harshvardhan Rane and the beautiful Mawra Hocane, the film is a young modern day love story encapsulating romance, heartbreaks and intense emotions. Melodious music by Himesh Reshammiya and powerful performances by the lead pair makes the film a perfect watch. Directed by the duo Radhika Rao and Vinay Sapru, Sanam Teri Kasam is a charming story of a bespectacled plain Jane 'Saru' (Mawra Hocane) who is rejected by all due to her simple appearance. Dejected Saru takes the matter in her own hands and reaches out to her dashing yet unruly neighbor Inder (Harshvardhan Rane) for a makeover. As luck would have it, their lives change when Saru's father renounces her due to a massive misunderstanding. With nowhere to go, Saru finds solace in Inder who is in process to transform her into a beautiful young lady. 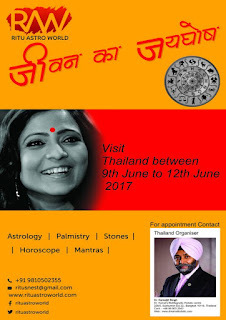 Chandigarh 30th May:- E-governance has become the governing mantra of our fast-developing nation. Digital India is a flagship programme of the Central government, with a clear focus on delivering citizen-centric services with the aid of Information and Communication Technology. Speaking on the occasion of digitisation of the Supreme Court of India, Prime Minister Narendra Modi said that E-governance is easy, effective and economical. It is also environment friendly. And paperless offices will benefit the environment. The e-governance project had a significant positive impact on the country. The e-filing and e-processing of documents have replaced manual filing and handling of paper documents, making government offices paperless. This initiative has ultimately reduced the physical interface of the business community with the departmental officers and provides a corruption-free environment with improved taxpayer services. Punjab, along with many other states, has been at the forefront of this drive to start and extend e-governance initiatives for the welfare of the citizens. Certainly, the decision of the Punjab government last year to set up Sewa Kendras in cities and villages across the state to deliver services expeditiously is a laudable one. There are 2,147 kendras across Punjab which provide about 67 services, including applying for various documents at one centre with a minimal fee. The kendras provide services related to birth and death certificates, arms licence, power supply bill, water and sewerage bill, tenant verification among many others defined under the Punjab Right to Services Act, 2011. They serve as a one-stop centre for citizens to avail a range of government services. There is a Sewa Kendra every 2.5 to three kilometres in urban and rural areas to facilitate citizens who were earlier required to travel 20-25 kilometres and stand in long queues for availing basic services. The Sewa Kendras can be transformative if allowed to continue. E-governance is national imperative; such a citizen-centric project should be the vision of current government involving local urban bodies in the state to mitigate the problems of rural & urban population. It would be interesting to see if the present government raises the bar above politics or choose to ignore the "Citizens FIRST agenda" or continue the hoary tradition of dumping projects in the name of politics. To see worthy public projects through the prism of political partisanship is short-sighted. Sewa kendras employ about 5,000 persons. With e-governance, the corruption and the proportion of paying bribes have reduced from drastically. Such is the buzz created by its success that several states like Kerala, Haryana, Orissa, Bihar, Madhya Pradesh and Maharashtra have shown interest to replicate the e-governance model. It also sends out a negative perception to other companies interested in investing in Punjab while it is possible there could be some lag in the functioning of the Sewa Kendras, surely that doesn't necessarily have to mean rolling up the project altogether. Rather, the government should encourage improving the working, so that the process of empowering citizens is not disrupted. That would be an anomaly in the making of Digital India. Chandigarh 30th May:- The regular driving test will not be conducted on 31st May,2017 at Children Traffic Park, Sector-23, Chandigarh due to monthly award and retirement programme of Children Police Officials for the month of May 2017. Chandigarh 30th May:- Consumer and health activists have come together to show concern over how a lower GST rate for bidis than for cigarettes will hurt the health of millions. The national NGO Citizens Awareness Group, headquartered in Chandigarh has informed that while the GST Council is still debating the structure of rates, there is overreaching consensus that tobacco needs to be taxed at the highest rate. While voicing his concern over the issue, the chairman of Citizens Awareness Group, Surinder Verma said that Bidis are mostly consumed by the poor strata of the society and keeping them under a low tax regime will not only be detrimental to public health but also anti poor. The central government should pay attention in this regard in its upcoming GST meeting to be held on June 3. We request that bidis should be taxed in highest slab of more than 28 per cent. Besides, It is disappointing that some states are in favour of lower taxation on bidis which shows that they are ignoring the health concerns over the commercial gains..
As per the relevant date over 1 million deaths in India every year are tobacco related and almost two thirds of tobacco consumers in India actually consume bidis leading to debilitating diseases and even death. According to a report published by the Union Ministry of Health and Family Welfare in 2008, Titled 'Bidi Smoking and Public Health', it reviewed 15 studies conducted in India. It stated that bidi smoking poses a very high risk for cancer and in many cases bidi smokers were at greater risk for oral cancer, stomach cancer and lung cancer than non-smokers. Ashim Sanyal, COO, Voluntary Organisation in Interest of Consumer Education (VOICE) said that Bidis are the most commonly used tobacco product in India, accounting for 64% of all tobacco consumption. Also Bidi's are disproportionately consumed by the poor and contribute majorly towards the tobacco death which needs immediate attention since it is making consumers poorer. Hence law makers should put Bidis in the highest GST Rate slab to discourage its consumption and save lives. The forthcoming 3rdJune GST Council meeting is hence a historic fiscal opportunity the Government should utilize to prioritize it's stated public health intentions- one of the fundamental pillars of the rate fitment exercise. Chandigarh 29th May:- Due to urgent maintenance of 11KV Urban 3 feeder, supply to parts of Sector 71 will be effected partially from 9AM to 3PM on 30.05.2017 Tuesday. 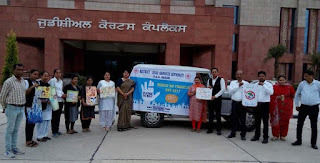 Chandigarh 29th May:- Women & Child Support Unit is going to organize the Health Screening Check-Up Camp for female under the "Asha Jyoti Scheme" with the collaboration of Dr. N.K Khandelwal, Head of the Deptt. Of Radiology, PGI, Chandigarh on 30.05.2017 from 8.30 am onwards at Women Police Station, Sec- 17, Chandigarh. All Women employees posted in all Police Stations/Units and the wives of police personnel's are invited for this free check up in Home Guard Building, Sec- 17, Chandigarh. Chandigarh 29th May:- Cox & Kings Ltd, the leading holidays and education travel group with operations in 22 countries across continents, has opened a new franchise store in Mohali. The store headed by Shalu Garg and Shivam Gupta was inaugurated by Anil Kumar Gupta- IRS and Commissioner of Customs. While interacting with media Shalu Garg said that the outlet is an endeavor to fill the gap of quality services in travel, in this region. Cox & Kings is a world leader, the No 1 in travel services in India & an award winning company. So it is an honor to be associated with it & bringing it into Mohali. Shivam who is just 23-years-old is a young entrepreneur who is passionate about the travel business, particularly luxury tours, said that he was in a job earlier & wanted to enter the world of business through an initiative focused on the travel industry. It is a dream come true for him as Cox & Kings are specialists of the travel trade & he will work hard to take the project to new heights in the region. This is Cox & Kings' 6th franchisee store in Punjab and the opening follows the popularity of their existing franchise stores in Chandigarh, Ludhiana, Amritsar, Jalandhar and Patiala. Domestic and International travel deals offered by Cox and Kings will be made available to the travelers at this new outlet. The store is one stop shop for all travel related needs such as customized tours, group tours, business travel, flights, travel insurance, trade fairs and many others. The store allows Cox & Kings to extend its reach as well as complement its existing full-line store presence in Punjab. Commenting on the launch, Karan Anand, Head-Relationships, Cox & Kings said that opening of the new franchisee store in Mohali is a part of our larger strategy to reach out to all possible segments and untapped markets. Mohali, being a commercial hub and a developing IT hub of the state, is a crucial market for us. With our unique offerings and professional services, we are confident of getting good response from here. It is noteworthy that Cox & Kings Ltd. ('C&K') is a leading leisure and education travel group with operations in 22 countries across 4 continents. It is one of the most experienced travel companies in the world, having been in operation since 1758. Headquartered in India, over the last three decades, C&K has transformed itself into a diversified, multinational travel conglomerate with a focus on the new-age global consumer. 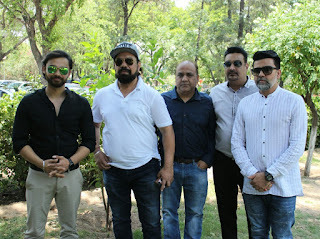 NDBG Entertainment and Yaar Beli Records Launch Akash Rupana’s First Song"Vaja Vuja Sikhh Lain De"
Chandigarh 29th May:- NDBG Private Limited under its new venture Yaar Beli Records today launched the first song of young talented singer Akash Rupana–'Vaja vuja sikhh lain de' today at Chandigarh Press Club. 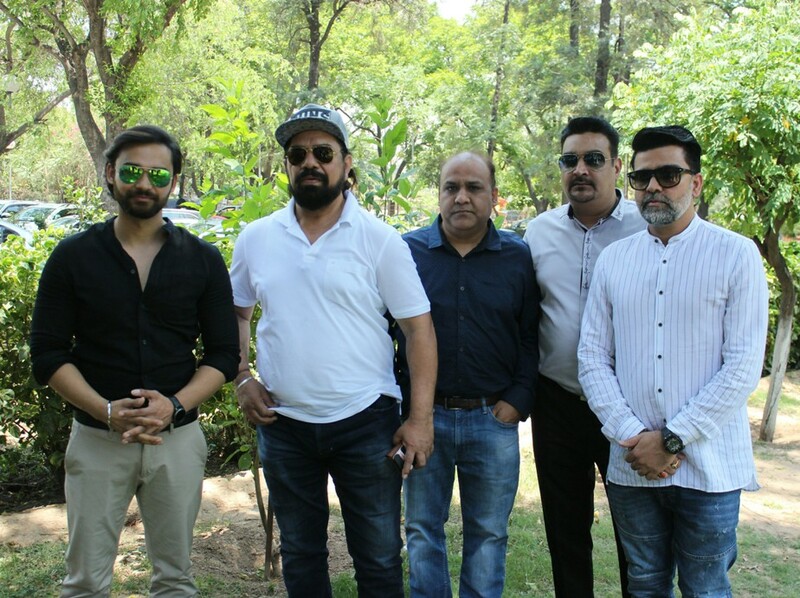 Present on the occasion were company's Director Gurbinder Singh Dhillon, singer Akash Rupana, Song's online promoter Lavish Kathuria from Bull 18 Network and other dignitaries. Gurbinder Dhillon informed that initially this song will be released on Youtube followed by other TV channels. While briefing the media Akash Rupana informed that Yaar Beli Records has been recently launched with an aimed to promote young and talented singers by offering them ideal platform. Gurbinder Dhillon said that we have been committed for nurturing hidden talents. NDBG Pvt Ltd is sponsoring cricket sports academies across the country from last five years so that budding cricketers from the grass root level can represent nation and bring laurel for their region, parents and country at last. Akash Rupana added further that he was fond of singing since school days and performed at many platforms. He is BA passed and learning the each details of music from his brother Manmohan Singh. Akash Rupana informed that Aman Chopra is lyricist, video courtesy Shivtar while music is provided by Jeffrozar. Priyanka Bhardwaj has acted during the song sequences and the entire shoot locale is from Chandigarh and Banur. Akash thanked his parents and friends for their support till the launch of his first song. While thanking Yaar Beli Records, he assured this song will not only to convey the good message to its audiences but also cherished by all. Chandigarh 29th May:- Famous for his roles in movies like Fateh and The Mastermind Jinda Sukha, actor Nav Bajwa who is a heartthrob of many, has officially released the first look of his upcoming Pollywood film titled 'Raduaaa'. Produced under the banners of Nav bajwa films and AK Productions, the actor has promised that this flick is one of its own kinds in the timeline of Punjabi film industry. On this occasion, renowned actor B.N. Sharma, Nav Bajwa along with producer Anup Kumar was present at the launch. Telling more about the movie actor Nav Bajwa as a director and lead actor in the movie said that he is all set to direct his second movie after Ishquaa. Raduaaa is the first ever Punjabi science fiction movie which is based on Steven Hopkin's time and travel theory in which the movie characters are traveling from 2017 to 1955 through a radio almost 62 years backward in time and trying to help the village in various ways by their technical knowledge of 2017. The movie has a different storyline with a different character that audience will surely adore. Along with me in a lead role, Gurpreet Ghuggi, there are many more known faces who will act in this movie like BN Sharma and Satinder Satti. Nav also shared that we are specially taking care of entertainment and enjoyment for every age group specially kids, youngster and families. We are creating a special set for 1950's time hope everybody will like and appreciate it. He further added that this movie is shot at the locations in Chandigarh, Mohali and Banaur and has set a different mood. Anup Kumar said that as an actor Nav Bajwa is a well renowned name in the industry and in a lead role in the movie. Entire team of the movie is very much dedicated and doing every possible effort to set new milestone in Punjabi movie industry. The movie is co-produced by Chechi Production (Vishal Chechi). The music of the movie is given by Ulumanati, DOP by Gifty Kang and edited by Puneet Asp. Chandigarh 27th May:- Dikshant International & Global Schools' first major event of the new academic session, the Inter House Drama , Music and Folk Dance Competition was organized successfully at Yavanika Open Air Theatre. The Chief Guests were Sanjeev Kumar Bajaj , Circle Head, PNB and Amar Kaushik , a noted director whose short film 'Aaba' has recently won several prestigious national and international awards .The film won the best short fiction film at the 64th National Film Awards, Best Screenplay at the 7th Dada Saheb Phalke Film Festival and 'Best short film' at prestigious international film festivals including New York Indian Film Festival, Berlinale, IIFLA,LA and Aspen Shortfest. 'Aaba' was screened at the venue for the first time in India. The film has been produced by the Chairman of Dikshant Group of Schools, Mitul Dikshit. Meanwhile the Dance & Drama competition was judged by eminent theatre actor Parvesh Sethi and senior journalist Shayeda Bano. Students of Dikshant International School (DIS) displayed their talent in an intense competition between the four houses. The singing competition comprised renditions of iconic songs by artists ranging from John Denver to Cliff Richard. The plays enacted were The Dear Departed by Stanley Houghton, Heavenly Express by Sharon Kay Chatwell, Debit and Credit by August Strindberg, and The Model Millionaire by Oscar Wilde. The folk dances reflected the rich legacy of culture across India. Manipuri, Kashmiri, South Indian and Lavani dance performances were imbued with grace. Interspersed in between were; heart winning performances by students of Dikshant Global School (DGS). Sanjeev Kumar Bajaj addressed the audience at the end and appreciated the students' effort in putting up the show; Amar Kaushik said that it was a pleasure to behold such spectacular performances.